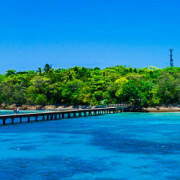 Green Island Resort is the only five star resort in North Queensland located on a tropical rainforest coral cay. 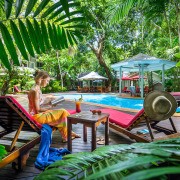 This eco-friendly resort is only a short ferry ride from Cairns, and is set amongst lush tropical rainforest and beautiful coral beaches, just metres from the Great Barrier Reef. Your experience begins with a 45 minutes cruise from Cairns aboard Great Adventures. Once you disembark the boat you will be greeted by one of the resort team, who will introduce you to the island and take you on a short tour before checking into your suite. Porters will deliver your luggage to your room. The resort itself is secluded from the day visitor facilities on the Island, with just 46 luxury suites built amongst the trees. A host of complimentary inclusions and activities are available to Green Island Resort guests. These include sunset drinks, snorkelling, glass bottom boat tours, guided activities with the Activities Officer such as fish feeding, nature walks and star gazing sessions. Eco-friendly toiletries and personal grooming items are also provided complimentary in your suite’s bathroom. At 5pm after the day visitors have left enjoy sunset drinks at the jetty with a choice of sparkling wine, beers or orange juice. Fish feeding takes place from the jetty where you will see many tropical fish and a turtle or two. Green Island Resort has two styles of accommodation, Reef Suites and Island Suites. Each is elegantly appointed and feature private balconies with either rainforest or pool views. The Island Suite is a twin room & provides a perfect tropical island family escape. Featuring two double beds, maximum occupancy is 2 adults and 2 children. Connecting rooms are also available at additional cost – Island Suite Twin rooms interconnect with an Island Suite King room. The Reef Suite is perfect for couples. These split-level luxury suites are spacious in size at 66 square metres, and feature a large king size bed, spacious lounge area, separate bath, shower and private balcony. Once you’ve settled in the island is yours to explore! For resort guests there are a wide range of complimentary activities as well as several exciting optional activities for those wanting some more adventure. At 5:00pm each evening find your way to the Jetty for the nightly fish feeding. Watch as enormous tropical fish surge to the top of the water for their nightly feed. This is a must do for those wanting to see and learn more about the island’s marine life. At 5.15 after the day visitors have left, join the activity staff at the beach for complimentary sunset drinks.An almost empty tropical island, a magnificent sunset and a glass of champagne – is there any better way to end the day? Green Island’s distance from the big city lights makes it an excellent spot for some amateur astronomy. On a clear night, the skies above Green Island are perfect for star gazing. Meet at Reception and don’t forget to bring the torch from your room! Enjoy an informed nocturnal view of nature, depending on the time of year you could see Sea Turtles laying eggs, spy on the nocturnal bird life or just stare at the stars. Relax in the guest lounge any time of the day or night with FREE wifi access. Enjoy a complimentary tea or coffee. Read the daily newspaper, magazines or peruse the library of interesting books. Television and a variety of DVDs are also available. For the children or young at heart, there are board games and a PlayStation console. Enjoy elegant dining with tropical cuisine. Featuring the option of outdoor terrace or air-conditioned dining. Open for breakfast, lunch and dinner. Definitely for the romantics! Enjoy a private, sumptuous seafood dinner on the beach and watch the sun set over the mainland (weather dependent). Choose to hideaway, relax and dine in the privacy of your suite. Midday to 10:30pm. Enjoy a freshly prepared gourmet picnic hamper. Available for breakfast, lunch and dinner. A menu and phone to the restaurant is located by the private guest pool for the convenience of house guests, wishing to wine or dine in the privacy of the Resort grounds during the day. Green Island Resort has been awarded Advanced Ecotourism Certification for preservation and their commitment to the island’s surrounding rainforest and reef, and the management of this eco-sensitive resort. Practices include minimisation of energy and water use, and conversation practices that include an extensive recycling program. Structurally, all resort buildings and infrastructure (e.g. boardwalks) were built with minimal vegetation clearing, in many cases the structures were built around the trees. No building extrudes above the tree canopy, therefore preserving the natural appearance of the island from the water, shoreline and air. The resort is self sufficient for power which is provided by four diesel generators enclosed in a sound proof building to prevent noise pollution. Waste disposal on Green Island is prohibited and all waste is barged back to the mainland for disposal, therefore the re-use of materials where possible is strongly encouraged. Green Island is committed to the preservation of the island’s rainforest and reef surrounds, and the sustainable management of this world class eco-sensitive resort.